A nationwide strike called by trade unions hit India hard as millions of industrial and blue collar workers struck work, affecting all vital sectors of the economy in varying degrees. A business body estimated the day's loss at Rs.25,000 crore as the strike crippled defence production, banks, insurance companies and the postal department besides strongly affecting almost all mines, steel industry and the power sector. Public transport was crippled or badly affected in different states, inconveniencing hundreds of thousands who were stranded at bus and railway stations in the absence of taxis and auto-rickshaws. While the government made light of the strike called by all 10 central trade unions barring the pro-BJP Bharatiya Mazdoor Sangh (BMS), the strikers called the protest an unprecedented success. "The response has been unprecedented," veteran Communist leader Gurudas Dasgupta told IANS. "In Delhi, we are seeing such an impact for the first time." Earlier in the day, the government tried to downplay the impact of the strike with the Petroleum Minister Dharmendra Pradhan saying the strike by central trade unions did not have much impact. "There is no impact on normal life," Pradhan told media persons after a meeting of the union cabinet here. He said the government has arrived at a formula on hiking minimum wages and would place it before all trade unions across the country soon. In the evening, the 10 unions said in a joint statement: "It has been an unprecedented strike (by) millions of workers. All sectors of the economy (were) affected." The Associated Chambers of Commerce and Industry of India pegged the loss to the economy at Rs.25,000 crore, taking into account the numerous direct and indirect losses. Production in state-run Coal India was severely hit. "Overall, the strike is 80 percent successful," a company official said. The strike was almost wholly peaceful barring in West Bengal where Left activists enforcing the shutdown clashed with police and supporters of the ruling Trinamool Congress, leaving several people injured. The strike was in support of 12 demands, including axing of labour law amendments, a minimum wage of Rs.15,000 a month, and against privatisation of public sector units. Union leaders said about 300 million workers were involved in the protest. While the shutdown crippled Kerala and Tripura, both Left bastions, it was felt in varying degrees in many other states. The unions said they expected the government to understand the grievances of the workers. "It must restart discussions with the central trade unions for concrete solutions to the demands, failing which the struggle will be intensified," they warned. According to the unions, the defence production came to a halt. The strike was said to be "100 percent" in the financial sector including banks and insurance companies as well as the postal department. It also hit hard coal, iron ore, bauxite, copper and aluminium mines, was "almost complete" in electricity and power sector and telecommunication, and "total" in tea gardens. It was the first such nationwide strike by trade unions since Prime Minister Narendra Modi took power in May 2014. In the financial sector, lakhs of bank and insurance employees - including those from cooperative banks and regional rural banks - stayed away from work, union leader C.H. Venkatachalam told IANS in Chennai. He said the strike was a success in cities like Mumbai, India's financial capital, and in New Delhi, Chennai and Kolkata. But unions in the State Bank of India, the country's largest bank, and Indian Overseas Bank did not take part. Trade union leader V. Utagi said operations were hit in Mumbai Port Trust. "And Maharashtra's 1.50 million government employees joined us." But public buses and Mumbai's suburban trains plied though their unions lent "moral support" to the strike. In Delhi, banks, insurance companies and industrial areas observed a shutdown. Most auto-rickshaws, the poor man's taxi, went off the roads. Delhi Metro reported normal operations. In Kerala, most IT firms in Technopark and Infopark reported thin attendance. The shutdown evoked mixed response in Karnataka. Buses and autos didn't ply while factories, banks and shops were closed. The strike hit transport and banking services in both Telangana and Andhra Pradesh. 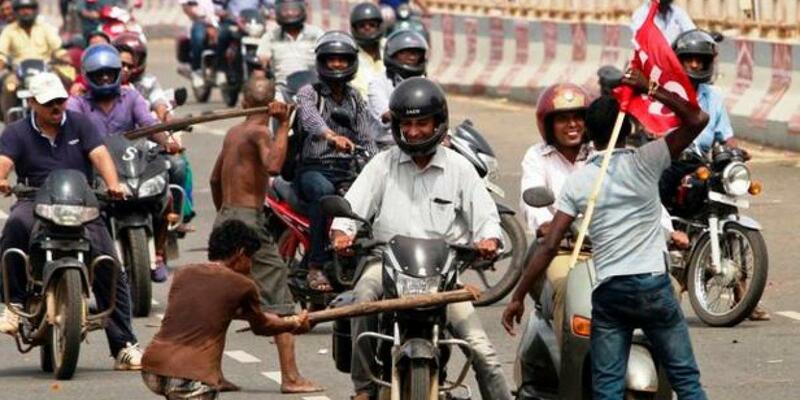 Normal life was hit in Bihar, where strikers blocked roads and halted trains in some places. In West Bengal, while the Left Front called the strike a success, Chief Minister Mamata Banerjee dubbed it a failure. Nearly 1,000 people were arrested for violence, she said. Clashes were reported from various districts including Murshidabad, Birbhum, North 24 Parganas and Hooghly in which a former CPI-M MP and two legislators were injured. Many political party offices were vandalis.